Gigantic Chive | Gurney's Seed & Nursery Co. Double the Size of Other Chives! Large, white edible flowers form loose globes atop elegant stems with soft, flavorful leaves. 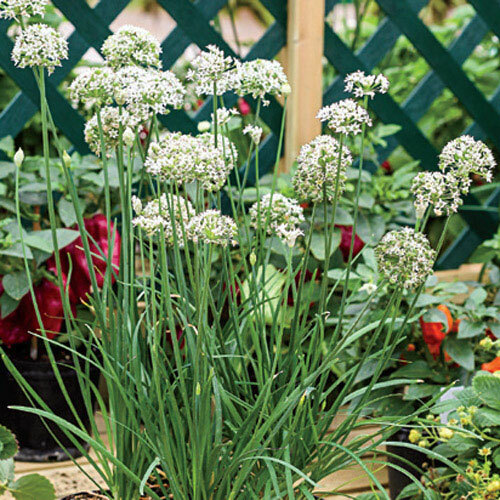 A true culinary favorite, its pleasant flavor combines chives and mild garlic in a larger, more decorative size. Perennial. Zones 4-8. 35 DAYS. LightFull sun to light shade. Flower FormSmall white flowers forming loose globes, flowers in August, may not flower till 2nd year. Soil RequirementsAverage, not overly-fertile soil. Seed CountApproximately 35 seeds per packet. CommentsLarge, white, edible flowers form loose globes atop elegant stems with soft, flavorful leaves. With the additional hint of mild garlic, it is a larger, more decorative size than normal chives.